Osteria Francescana restaurant is definitely for now the most famous and well-reputed restaurant in Italy. It has also been ranked as one of the top five restaurants worldwide for the last couple of years and did also receive its third Guide Michelin star this year. Its owner and head chef Massimo Bottura is equally famous. Consequently we all had high expectations in regards to this dinner. 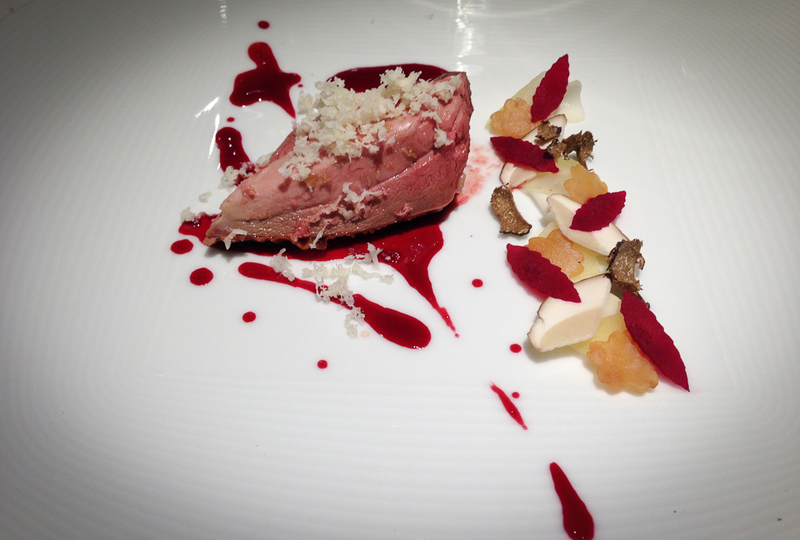 Osteria Francescana was renovated during the summer (of 2012) and reopened again in the beginning of September. One interesting thing (that I like…) is that entrance now is very discrete (this is to my knowledge one of the changes made) and if you do not know in advance that there is a restaurant here you will not by “accident” enter this restaurant (so make sure to have the full address written down or you will likely miss it/pass it). 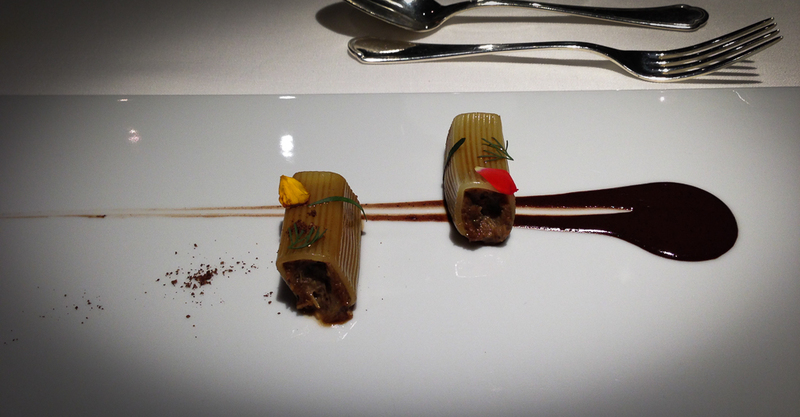 The restaurant is located in the heart of Modena and do only have 11 tables so a reservation is a must. We opted for the Sensations menu. 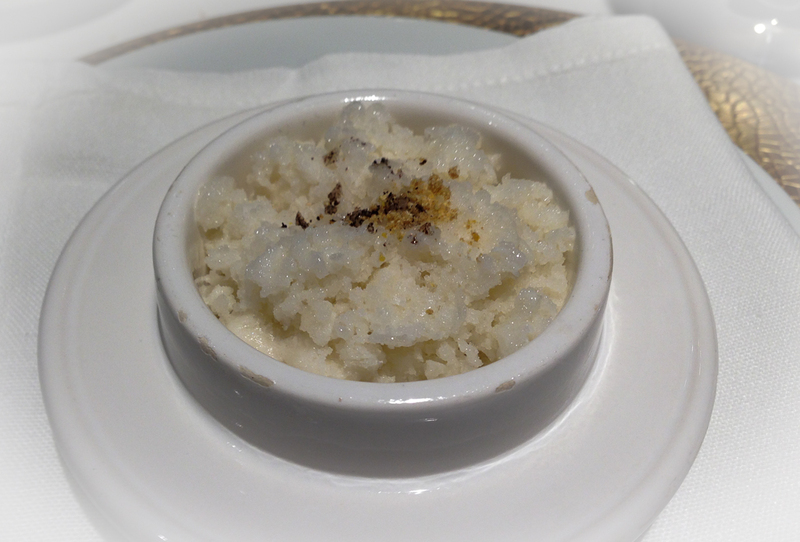 First out was Almond “granita” with capers, coffee cream and bergamot and this contained a flavor-combination I have never experienced before and even though I did not like the taste to 100% I consider this dish very interesting and well balanced. Next we had “Razor clams and their friends”. This was a so-called deconstructed dish (i.e. taking the parts of a dish and separating the individual components into a new usage) first practiced by Ferran Adria at elBulli (where also Massimo Bottura has worked). 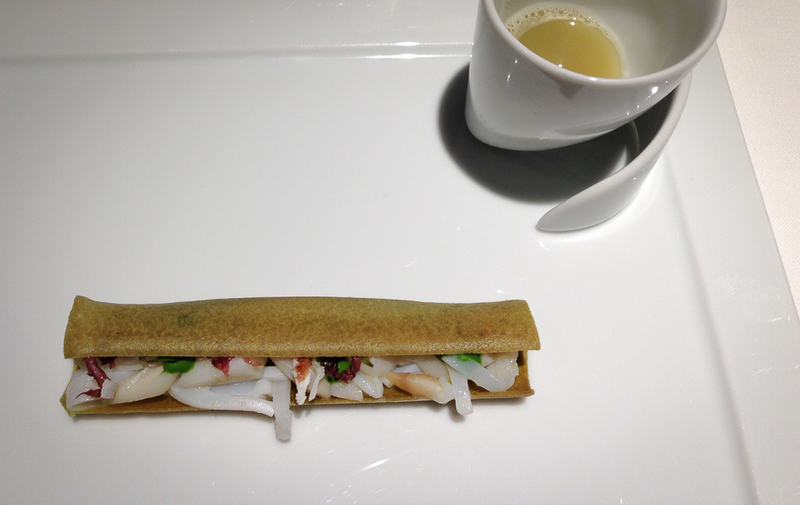 The razor clam shell had been recreated using a fine pastry flavored with seaweed and inside the shell was a mix of razor clams, squids, scallops, mussels and seaweed. On the side was a razor clam broth, which were recommended to have after the razor clam was finished. When we were served the next dish, “Baccalà Mare Nostrum: salt cod filet in Verdute olive and tomato broth served with dried tomato pesto, Noto almonds and fragrances of Pantelleria”, Massimo Bottura joined our table for the first time and explained the dish. I really liked this dish but the cod was for me a little bit rubbery and this was also the case for one of the other persons in the company (the other ones had perfect ones). That said there was definitely nothing wrong with the taste but this difference in the structure confused me a little bit (the cod was probably prepared sous-vide so it should not be any differences in my opinion). Even for the next dish Mr. Bottura visited our table and discussed the food (highly appreciated by all of us) and this plate was called “Guitar string pasta simmered in burned calamari broth and finished with Fines de Claire oysters and extra virgin olive oil”. 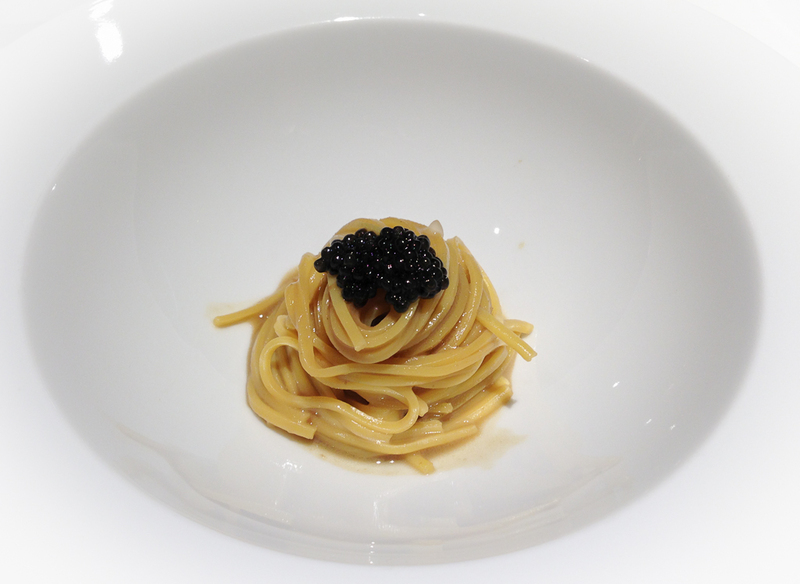 The string pasta had been cooked in a broth of calamari and was finished off with Beluga caviar, oysters and extra-virgin olive oil. This dish had a gorgeous taste and texture that everybody liked a lot. Soft and crunchy Branzino with “cacciatora” rabbit sauce. Branzino is a silver-skinned fish that goes by many names and is for me best known as Sea Bass. 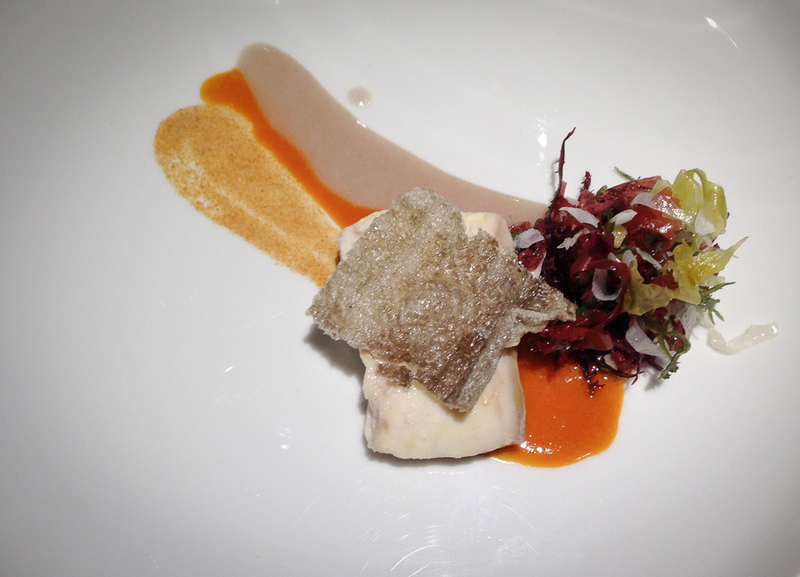 A rabbit sauce and a crispy skin accompanied the Sea Bass. 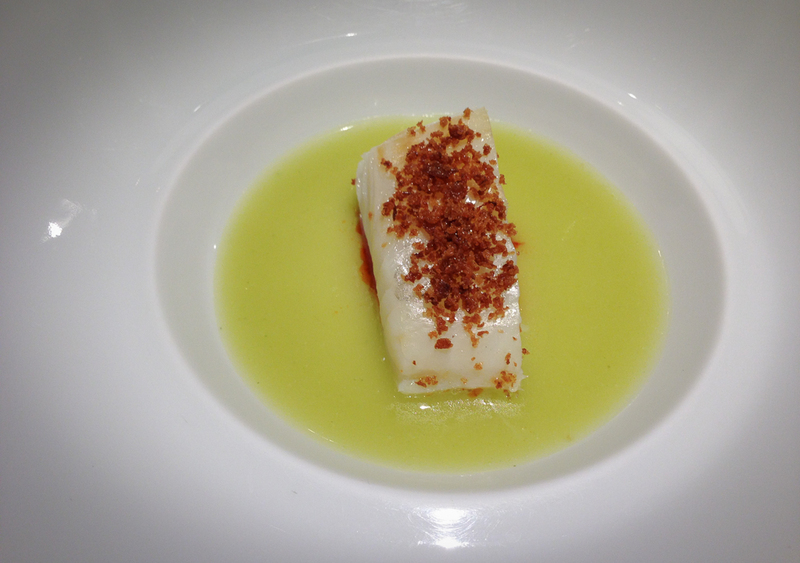 Personally this had a better texture than the previous cod (probably it was also prepared sous-vide). Tribute to Normandy. 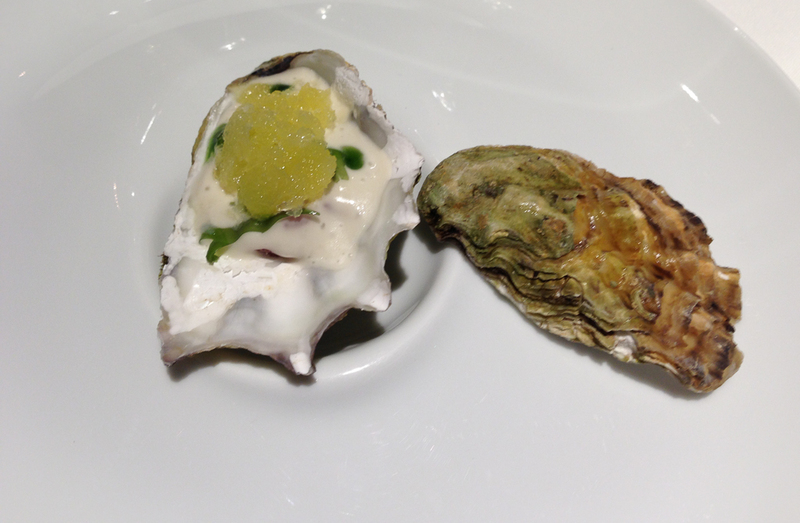 Next up was an oyster, at least from a first perspective… It turned out to be a tartar (i.e. 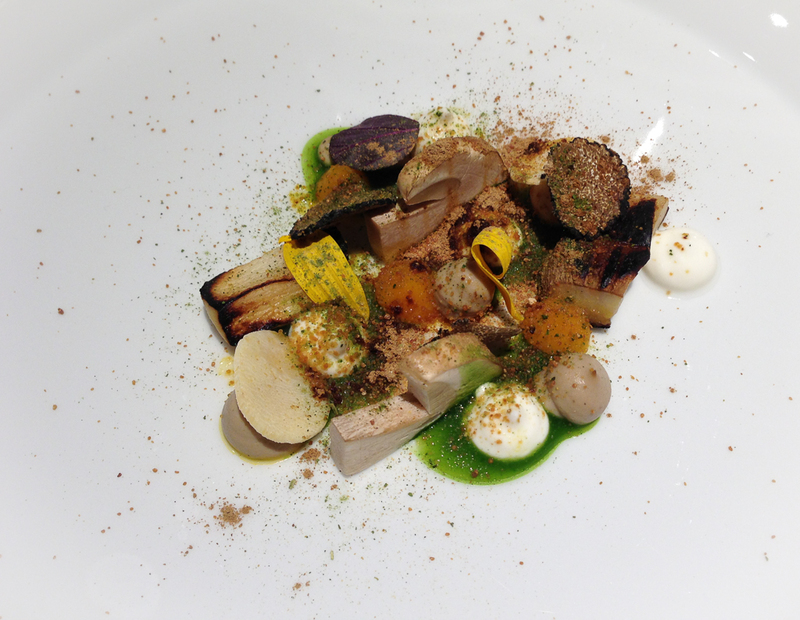 raw) of lamb together with mint, green apple and granite. I am not sure if it really contained any oyster but it for sure tasted like oyster. You were advised to have all the contents in the oyster shell in one go, to savor all flavors together. Think Green in Autumn. This dish included some mixed mushrooms and Parmigiano-Reggiano cheese on a green sauce. Casserole Pidgeon, sour and mineral salad with Balsamic juice. I do not understand why not more restaurants serve pigeon that usually is very delicious. This one was perfect! Feather and plume Quadrotto. For the next dish we once again had the pleasure to have Massimo explaining the plate for us at the table (and in retrospective I regret that I did not take notes during the dinner). Anyway, this plate was a kind of transition from the main course to the desserts. Consequently, the next dish after this one was a dessert but all of us actually expected and wanted one more main course before heading on to the desserts. Think Pink. This was the first “real” dessert and it consisted of a mascarpone and cherry mousse with pink meringues. Oops! Broken fruit pie. This is classic dessert at Osteria Francescana and it is supposed to visualize a tart plate after it has been dropped on the floor. It was a nice sweet and sour tart. The dinner was then finished with a few (very few…) petit fours to the tea and coffee. Again, all of us had really both anticipated and wanted another dessert before ending the dinner. This is the best Franciacorta (a DOCG sparkling wine from Italy/Lombardy) I have tasted. It is the prestige wine from Ca´del Bosco and we had the latest vintage released, 2004, made of 55% Chardonnay, 25% Pinot Bianco and 20% Pinot Nero (from 16 vineyards with an average vineyard age of 39 years). The base wines are created exclusively through the alcoholic fermentation of first-portion must (about 40% of grape weight) conducted in small oak barrels, where they are aged for around 6 months. Only the finest base wines, from at least 16 different batches, are later blended to create this cuvée. Very long bottle fermentation on the yeasts in underground cellars at a constant temperature of 12°C. 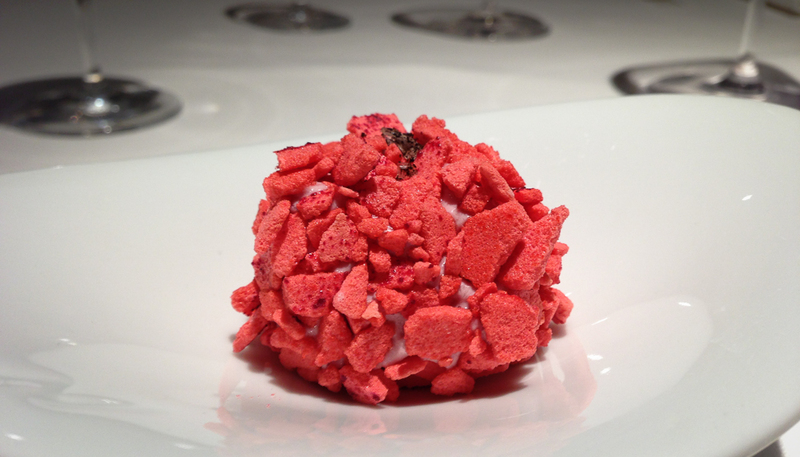 Gallery | This entry was posted in Italy, Restaurants and tagged Fine Dining, Food, Guide Michelin, Italy, Massimo Bottura, Modena, Osteria Francescana, restaurant. Bookmark the permalink. 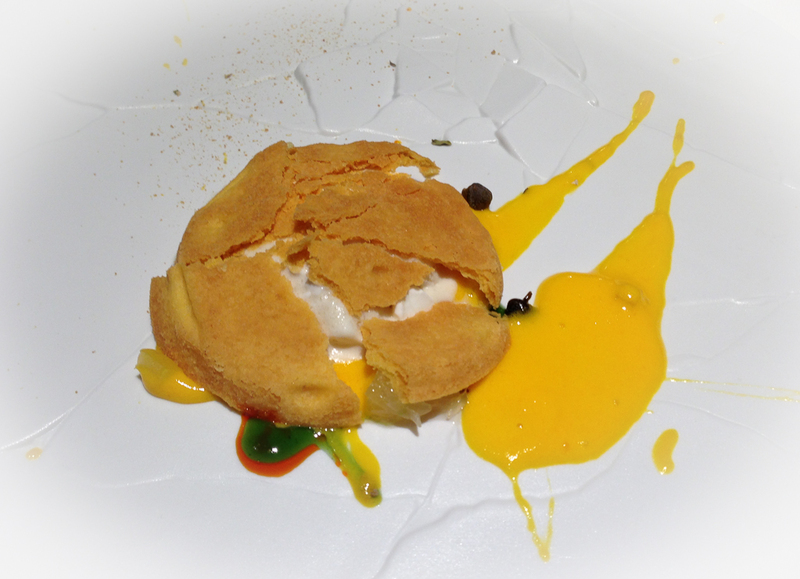 Osteria Francescana is amazing, I live in Modena but I never had the chance to have a meal there. Thank you for sharing these pictures.